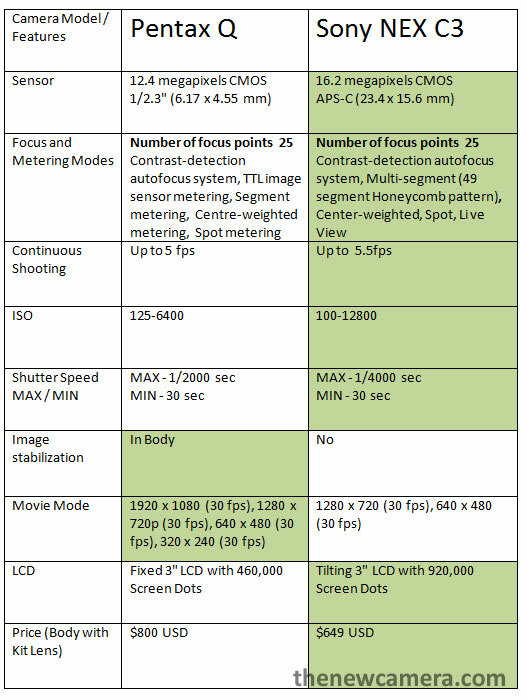 Sony NEX-C3 have bigger and better sensor, Pentax Q features Full HD recording and In body Image stabilization, Which one is more better? Read the Pentax Q vs. Sony NEX-C3 comparison Review and find out yourself. Advantages of the Sony NEX C3 over Pentax Q: Sony NEX-C3 features 16.2 Mp APS-C Sensor, the bigger NEX C3 Sensor will give you more megapixel and dynamic range while shooting, The NEX-C3 features 25 AF Points with Multi-segment (49 segment Honeycomb pattern), The Continuous Shooting of NEX is 0.5 Sec faster compared to Pentax Q, ISO speed ranges up to 12800 and creates less noise compared to Pentax Q under low light condition. The Sony NEX C3 Comes with Tilting 3″ LCD with 920,000 Screen Dots and available only at $649 with kit lens. Advantages of the Pentax Q over Sony NEX-C3: Pentax Q features In body Image stabilization and captures Full HD 1920 X 1080 @ 60 fps. Conclusion: The Sony features bigger sensor, good ISO range and Tilting 3″ LCD at lower cost, Pentax Q features in Body IS and Full HD Recording at 30 fps, We highly recommend you to buy Sony NEX C3 if you are still shooter, but if you want a good movie mode in your first compact Mirror-less DSLR go for Pentax Q. More about Pentax Q – When the focus mode is set to AF-S and the AF button is pressed during Live View, the displayed image will disappear and AF will be activated. Once focused, the image will be displayed in Live View again. Keep the AF button pressed until the Live View image is displayed again.